Songs and verses upon several occasions, [ca. 1680?]. 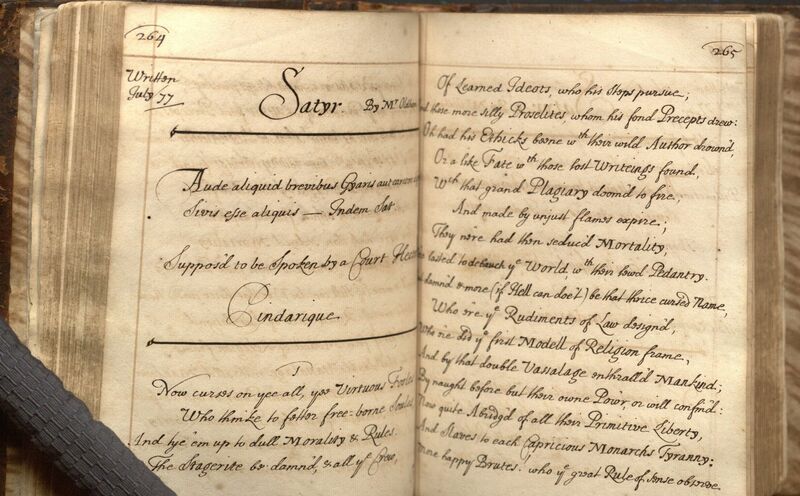 Manuscript on paper, in a single hand, of about 59 satirical poems and songs by John Wilmot Earl of Rochester, John Oldham, John Dryden, Aphra Behn, and others. Poems include Rochester’s Satyr Against Man, Upon Nothing, and Tunbridge Wells; Dryden’s MacFlecknoe; Shadwell’s Upon A Late Fallen Poet; and George Etherege’s Ephelia to Bajazet. Beinecke call number: Osborn b105. This entry was posted on May 6, 2010 at 6:00 am and is filed under Uncategorized. You can follow any responses to this entry through the RSS 2.0 feed. You can leave a response, or trackback from your own site.